LOS ANGELES, March 10, 2018 /PRNewswire/ -- TEN: A Discovery Inc. Company today announced that AUTOMOBILE, America's leading automotive lifestyle brand, revealed its 2018 All-Stars at the Amelia Island Concours d'Elegance. Eight cars were honored this year from a pool of 26 all-new, heavily revised, or significant variants of vehicles available in the U.S. in calendar year 2017. 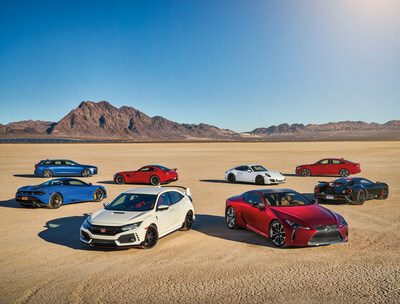 The AUTOMOBILE staff spent multiple days driving the assembled array of 26 All-Stars contenders on the SPEEDVEGAS track in Las Vegas and on an alpine pass at Nevada's Mount Charleston. After the evaluation period, votes were cast for the winners by private ballot. "This year's AUTOMOBILE All-Stars field was one of the most impressive we've ever assembled. From affordable pocket rockets to full-blown supercars, we invited the best-of-the-best because we don't do price caps or narrow categories," says AUTOMOBILE Editor-in-Chief Mike Floyd. "All 26 vehicles on hand were All-Stars, really. But when the ballots were tallied, eight stood out just a hair above the rest in what turned out to be an extremely close vote." To learn more about the prestigious awards and view photo galleries, videos, and much more, please visit the event hub at: www.automobilemag.com/allstars. The racing-inspired Ford GT's aerodynamics, steering, braking, and suspension setup are phenomenal, allowing you to attack apex curbs with an aggressive I-will-own-you style that seemingly rewards drivers more the harder they push. The GT proved itself as one of the best, most track capable production cars in years. It's a zero-compromises speed master, and one of the most intriguing cars of the past decade. The Honda Accord Sport is a no compromise daily driver with loads of interior room, ample cargo capacity, and driving dynamics that excite and engage. Honda's brilliant automotive engineering just shines through. The Accord Sport is both comfortable and fun to drive in a way Honda has long been known for with the simple, honest character of a car designed and built well. In execution for its intended mission, the Accord Sport ranks as one of the greats. The Honda Civic Type R sets an astonishingly high benchmark in the performance-per-dollar category, and it easily stole hearts and minds at this year's All-Stars shootout. When it comes to real-world performance, the Type R delivers about as much fun as we would ever want or can reasonably use. On a track, the R will ably punch above its weight, and it's no stretch to put it in the same driver-satisfaction category as sports cars costing twice as much or more, a major compliment. The Honda Civic Type R is a practical rocket ship, an incredible value, and a most worthy All-Star. The LC 500 is a halo product Lexus should be proud of. With an overall presence that causes people to gawk, the grand tourer delivers animated styling, exemplary fit and finish, and lavish trim with a satisfying feel. With solid, predictable handling on the street and on the highway, it's effortless and heavenly. It's also a car we're proud to call a 2018 All-Star. Supercar styling, power, handling, drivability—it's almost unbelievable how many boxes the 720S ticks. The latest McLaren is one of those exceedingly rare sporting machines that truly become one with their driver. You wear the car like a wet suit, and through that fine skin you feel every tickle of the road, easily sense the grip of the tires, and instinctively grasp the approaching limit. Few cars of such extreme capability are so reassuring to push hard. Emotion seems to erupt around this car. The Mercedes-AMG GT R makes 577 horsepower and 516 lb-ft of torque, sending it all to the huge 325/30R-20 rear tires in a flash, pulling hard all the way to redline in a most unturbolike way. The sensation of unrelenting acceleration is aided by a brilliant dual-clutch gearbox, while the brakes are exactly what you would expect—superbly effective with loads of feel. The excellent multi-setting traction control allows as much power to the tires as they can take while still pulling massive cornering loads. Nothing but impressive. The GTS does everything well. From top to bottom this Carrera whispers balance, the kind that makes it a joy to drive even moderately fast. Porsche's decades of refinements come through perhaps most clearly in this model, which provides just enough edge without abusing passengers or overstaying its welcome. It has some of the best steering on the planet, a chassis that's hardwired to your backside, brakes that never say "uncle," and speed you literally have to see to believe. Probably the best all-around 911 ever. Beneath the V90's slick surface treatments reside the usual Volvo underpinnings—a feeling that is solid, trustworthy, and built to last. Its 54 cubic feet of cargo room with the second-row seats folded is more than enough room to pack in gear for two for a weekend at the lodge—or for a pack of dogs. If you like station wagons this is the one to have. Good-looking, great interior, plenty of room, plenty of performance, and good road behavior. AUTOMOBILE, a brand of TEN: A Discovery Inc. Company, is America's leading automotive lifestyle brand, with a total audience of more than 5.7 million across its print, online, and social channels. AUTOMOBILE is home to the annual All-Stars awards and is written for the sophisticated enthusiast. For three decades, AUTOMOBILE has set the standard for automotive journalism, maintains a devotion to offbeat adventures, and continues to emphasize #noboringcars. TEN: A Discovery Inc. Company is the largest automotive media company in the world, bringing together Discovery's fast-growing Velocity network and TEN's entire automotive digital, direct-to-consumer, social, and live event portfolio, including MOTOR TREND, HOT ROD, ROADKILL, AUTOMOBILE, and more than 20 other industry-leading brands. With a cumulative reach of more than 131 million, the company encompasses Velocity's #1 TV network for automotive superfans, MOTOR TREND's #1 automotive YouTube Channel, and Motor Trend OnDemand, the only auto-dedicated subscription video-on-demand service. For more information, visit ten-discovery.com.